Comprehensive review of Fake Bake Flawless Self Tan Liquid. 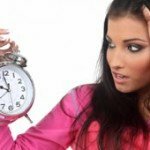 See what real experts have to say about this self tanning product. Fake Bake Flawless is one of our favorite “liquid” self tanners that we have reviewed. 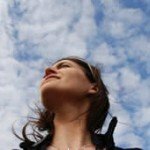 We found a lot of great things that we love about this product. It not only smells great, but dries super fast! We would recommend the color that Fake Bake Flawless produces for almost every type of self tan user out there. The only challenge with Fake Bake Flawless is the spray bottle top. Applying this product was very messy, especially if you do not have the tanning mitt. Fake Bake Flawless weighs in at $24 for a 6 oz. bottle ($4 per ounce), which puts it in the premium pricing range. 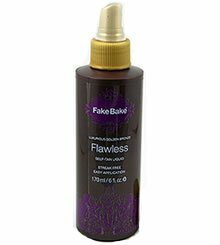 Fake Bake Flawless sprays out of the bottle a rick dark brown. It’s very thin liquid consistency makes it very watery which causes some trouble during application. This product comes with a professional mitt and detailed instructions for application. It said to spray the self tan liquid onto the mitt and then rub in a circular motion bending knees and elbows when applying in those areas. It feels like Fake Bake Flawless dries instantly! This is due to the fact that it’s a liquid that contains alcohol, which dries evaporates quickly. Further, since it isn’t a lotion there’s no moisturizer in the product which usually contributes to the length of drying time; lotions take longer to soak into the skin. Within 10 minutes of applying Fake Bake Flawless I was completely dry with no worries of having the color rub off on my clothes. Fake Bake Flawless, despite the Fake Bake name, smells nothing like the DHA odor that I associate with the phrase “Fake Bake”. It smells really good, light and refreshing and is sure to draw compliments from just about anyone who smells it. The perfume smell of Fake Bake Flawless stayed with me until I showered. Then there were no traces of DHA or even the pre-application perfume (unfortunately). We were thrilled with the color that Fake Bake Flawless produced. Even the guide was natural looking. The color was distributed evenly and gave me a glow like someone who lives in tanning hot spot like Miami. It’s not the darkest product out there; but it’s nice color nonetheless. My skin started developing color instantly and the color stayed with me about 5 to 7 days, which is really good for a self tanner. Twice a week applications would keep you tan all week, and year-round. Absolutely, Fake Bake Flawless is a great product for men. The smell is great (not super girly) and its quick drying time and streak-free appearance will leave your skin looking like you just got back from a tropical vacation. I don’t see any issues except for maybe the messy application. Fake Bake Flawless costs $24.00 for a 6 oz. bottle, which equals out to $4.00 per ounce. This price per ounce is pretty consistent with most high-end self tanners. To buy Fake Bake Flawless Self Tan Liquid, click here.